Thousands evacuated before Hurricane Harvey made landfall on the Texas Gulf Coast in August. Others had to be rescued from widespread flooding. About 4,000 people sought help at North Texas shelters, and 120 families have decided to stay. 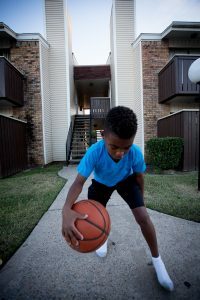 A single mom sees her future in Fort Worth. In less than two weeks, the curtain goes up on a Christmas program at Grace Tabernacle Missionary Baptist Church in Fort Worth. The kids in the cast are using their spare time to practice. 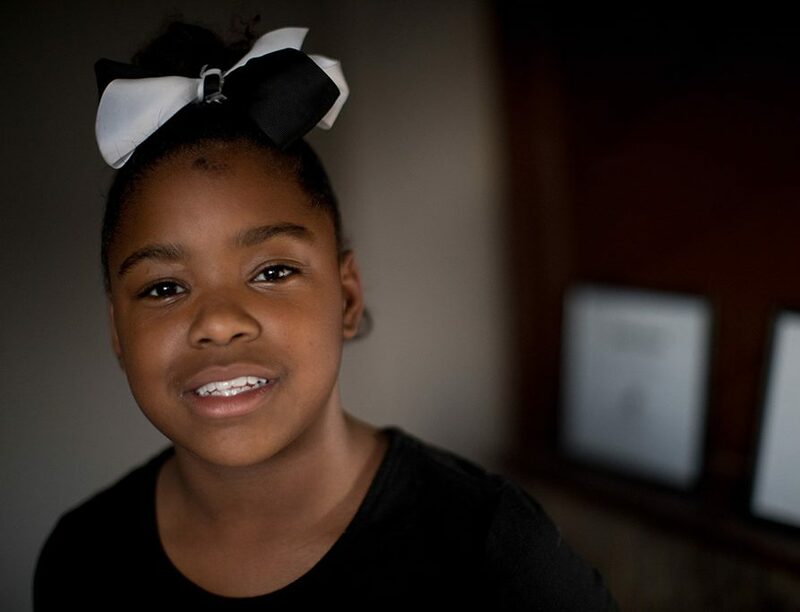 Eleven-year-old Da’Kera McElroy and her friend are perfecting the Whitney Houston version of “Joy To The World.” Her younger brother, 10-year-old Da’Koryian, who goes by Kory, belts out a Michael Jackson ballad. This diligent rehearsal, of course, happens in between cartwheels, basketball and some good old-fashioned arguing. 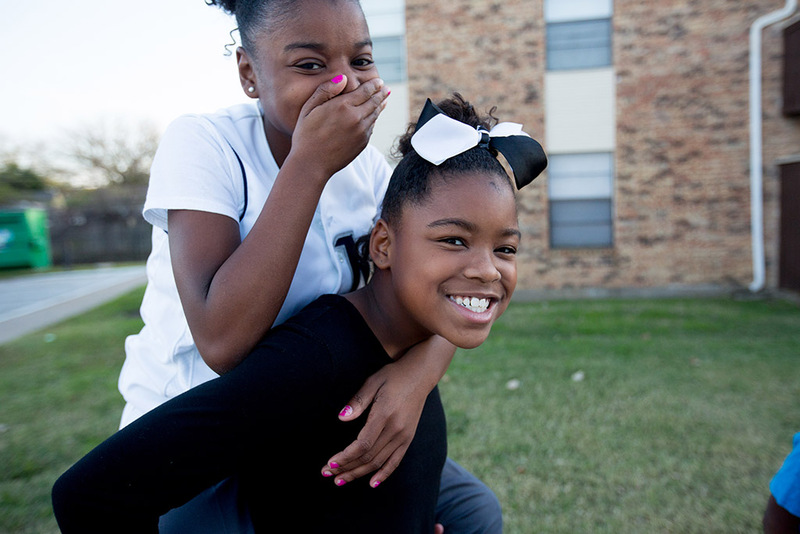 These siblings go to church, play sports and have friends. And they’ve only been in Fort Worth for a few months. The family was living in Port Arthur, which Harvey hit hard. 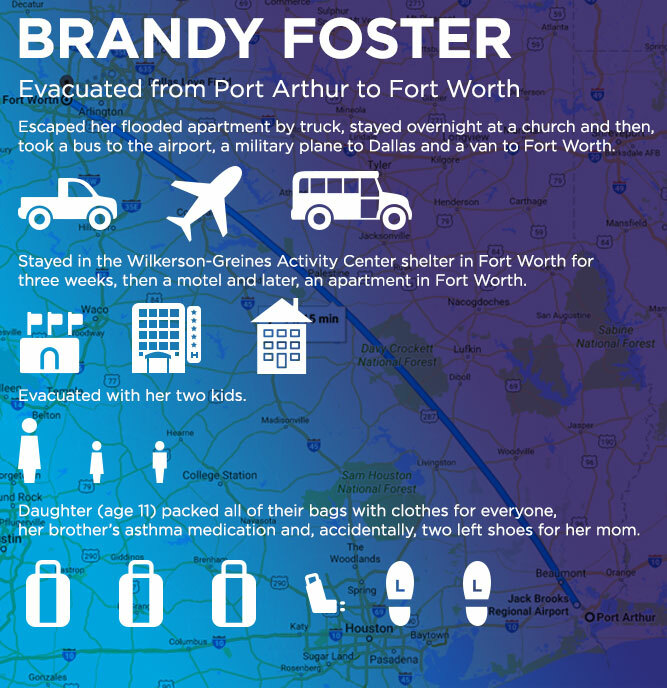 Brandy Foster listened to the rain pound her apartment for three days; it just wouldn’t stop. She couldn’t sleep. The flooded parking lot surrounding her home meant driving away was out of the question, too. Luckily, help found them: volunteers with boats, and U.S. Coast Guard helicopters. Foster says a foot of water was inside her apartment at this point. It was time to go. She turned off all the lights, locked the door and left. Foster and her family got on the back of a truck, which took them to a church where they spent the night. Then a van drove them to the airport, a military plane flew them to Dallas, and a bus shuttled them to a shelter in Fort Worth. It was a wild journey. Da’Kera could have lived without the flight. “It was bumpy, there was too much noise, and it had a bad smell,” she said. Those first few days in Fort Worth were chaotic. Foster says while she felt lucky to be safe and dry, her head was full of questions. Living in a shelter wasn’t easy. 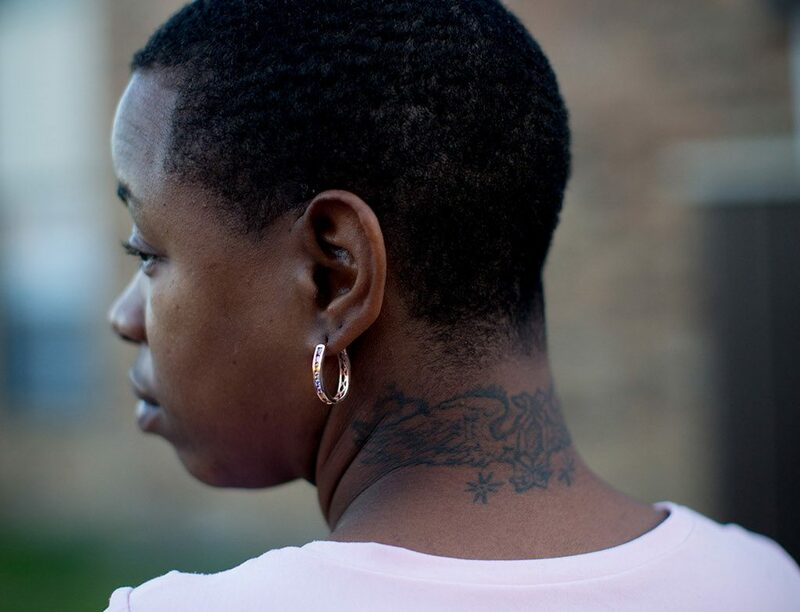 Foster was used to working, taking her kids to school, and watching football games. Harvey destroyed all of that. In the midst of the pain, though, she noticed something. The people manning the shelter and the volunteers dropping in and out seemed to care. “They would come by your cot or your bed and they would actually ask you, ‘Are you OK? 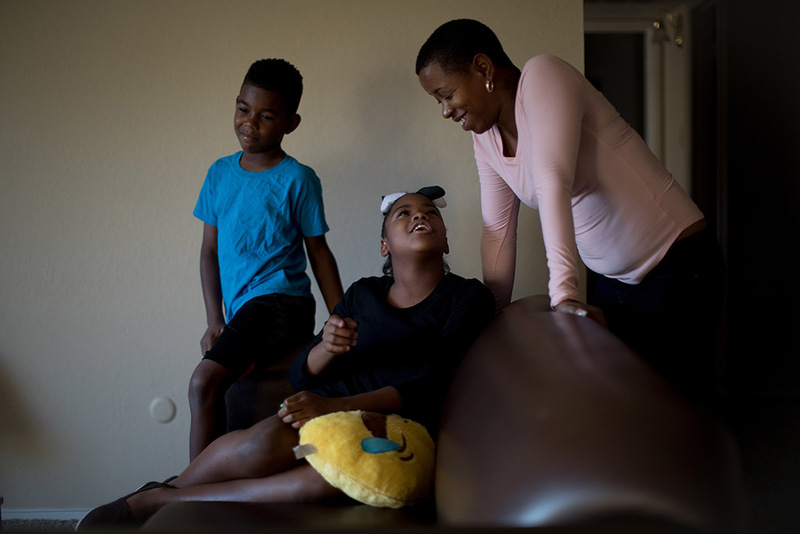 Do you need anything?’ They made my kids feel like they didn’t miss anything,” Foster said. 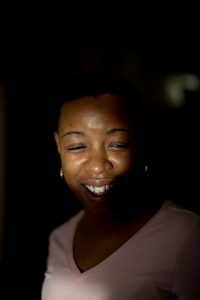 When Catholic Charities Fort Worth showed up and offered to help Foster find a job and a place to live, she decided to stay. After three weeks in the shelter and a few more in a hotel, she moved into an apartment. Catholic Charities made sure the deposit was paid, the lights were on, and there was furniture inside. “They took their personal cars and a U-Haul and they moved us in with everything that we had,” she said. Foster works as a housekeeper at the Baylor Institute for Rehab. She’s earning $4 an hour more than she was as a janitor in Port Arthur. She likes her kids’ school; there’s a good aftercare program and tutoring available. She feels like Fort Worth is her future. Foster says her father, who struggles with drug addiction, evacuated with them originally, but decided to return to Port Arthur instead of staying in Fort Worth. She says Catholic Charities offered him the same support she received. Foster really feels like she has. She’s hopeful, and her kids are happy. “It’s bigger. They got trampoline parks. More trampoline parks. 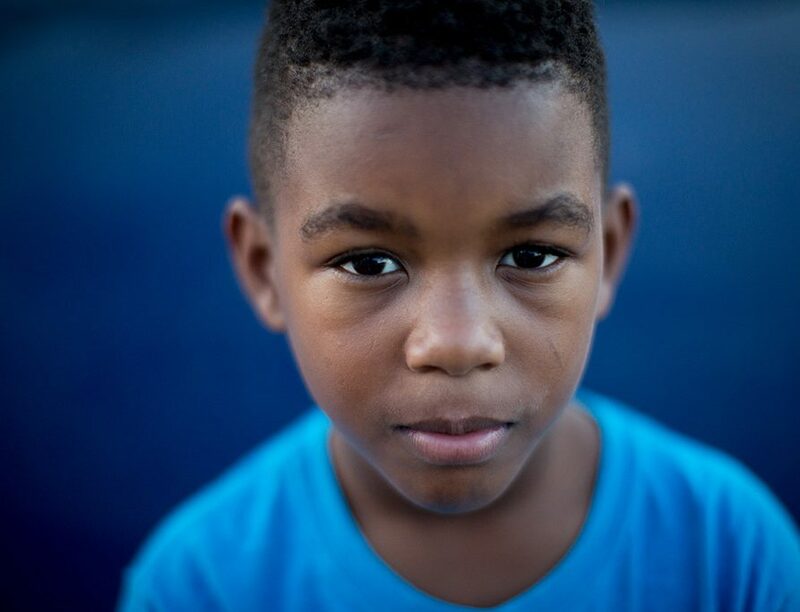 Because in Port Arthur, they didn’t have trampoline parks, we had to go to Beaumont,” he said. Foster says leaving southeast Texas behind wasn’t easy. Now, she feels like a little voice inside her is cheering her on. “OK, this is your opportunity to actually instead of being a single mom, to be a successful mom,” she said. She just never planned on that path to success being paved by a destructive storm.